Grace Klein Community loves helping bring an adoptive child home to their forever family. Sometimes we help with yard sales or receiving funds for the adoptive family, but this time – it’s a SHOE drive. In partnership with Funds2Orgs, Grace Klein Community is hosting a SHOE DRIVE in support of the Burke Family Adoption… and WE NEED YOU. 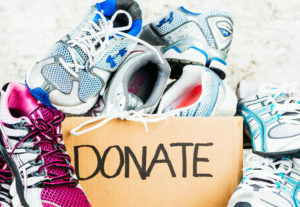 Consider donating those shoes you haven’t worn in a year, the pairs that your kiddos have outgrown, or you can even be CRAZY and give your favorite! The shoes will bless people all over the world, empowering micro enterprise business programs in Haiti and other third world countries, and the Burkes will receive funds for their adoption. Sounds like an awesome win-win for everybody!! Can you help collect some shoes??? Can your kiddos decorate their wagon and help collect shoes in your neighborhood? Can your small group collect shoes? What about your church, kid’s soccer club, your child’s school classroom, your office? Download a flyer HERE and start a shoe drive today in your neighborhood supporting the Burke Family in their adoption journey. The Burkes are up to their waists in shoes! Can you join in on the fun?? We Need Shoes – any size, gently used. If you would like to make a tax-deductible monetary donation towards the Burke Family adoption, your generosity would be greatly appreciated. Check donations can be mailed to Grace Klein Community, 1678 Montgomery Hwy #104, Birmingham, AL 35216 OR donate online HERE. Please write ” Burke Family Adoption” in the memo line. Thank you from The Burke Family for your love and support as they become a Family of 6! !